Analysis Libya: what price victory? In a new analysis piece for Ceasefire, Akkas Al-Ali considers the dawn of a post-Gaddafi Libya, and the course of the Arab Spring so far. After 42 years of repressive rule and a revolution that has been six months in the making, the death rattle has sounded for Africa’s King of Kings. The united forces of the National Transitional Council – an alliance created out of necessity – have taken Tripoli and delivered an historic coup de grâce to the Green Revolution. But before we join in with the chorus of victory, we would do well to remember that regime change has been the objective from the start: before the UN had even established a no-fly zone over Libya back in March – ostensibly to protect civilian life – the opposition had already been officially recognised by France’s Nicolas Sarkozy. Although the unrelenting progress of the Arab Spring is welcome, not least for its unravelling of autocratic dictatorships hitherto propped up and supported by Western governments – Egypt, for example, had been for over three decades one of America’s strongest allies in the region and the recipient of a $2bn annual stipend – Libya has been the beneficiary of a different kind of Western intervention. Dubbed by Ronald Reagan as the ‘mad dog of the Middle East’, Gaddafi faced UN sanctions and international ostracism on the one hand and Tony Blair’s blood-soaked hand of friendship on the other. Still, more welcome would have been the Brother Leader’s downfall at the hands of his own people and not through Nato. The Arab Spring, now turning into the Arab Autumn, represents a crisis of global capitalism which has magnified the problems and contradictions of a region crippled by decades of Western intervention. The spread of the free market problematises the notion that states – particularly those in the developing world – are able to enjoy economic and political sovereignty on their own terms; something that is left for the White House and its European allies to determine. What the Arab Spring has shown us is how brilliant our Western leaders are at dealing with the crisis, skillfully adapting their approach to suit their needs: euphoric one minute, apprehensive the next. With its long-time adversary, the West’s reaction towards Libya was immediate: the establishment of a no-fly zone, as well as military intervention and humanitarian aid. By contrast, its neighbours Tunisia and Egypt – two pro-West autocracies – benefited from the diplomatic approach: citizenship rights and the freedom to protest were championed at the beginning, while outright condemnations of the regimes’ violent suppression and crackdown were reserved until the very end. In Bahrain’s case, the West adopted an even softer approach. Timidly, our leaders urged the country’s Western-leaning monarch to “listen to his people” – calls that were routinely ignored in Manama. When Saudi forces entered the tiny Gulf kingdom in mid-March to brutally suppress the protests and to ‘restore order’, Washington and London stood idly by and just watched – with not a single word of condemnation. A few days earlier, when protesters had gathered outside the US embassy in Manama, carrying placards reading ‘Stop supporting dictators’, an embassy official emerged from the building to hand out doughnuts to the crowd. In the case of Yemen, a country the US is unable to envisage without President Ali Abdullah Saleh at its helm, there have been repeated calls from the West for the country’s opposition to engage in political dialogue to end the impasse. Nevermind that Saleh’s true legacy to Yemen has been a litany of broken promises and lies stretching over three decades. Most outrageously, until only this week Syria received understatement, two-faced platitudes but not a single expression of condemnation from Washington. Back in March, Hillary Clinton stated that it was unlikely the US would intervene in Syria since Congress still viewed Bashar al-Assad as a reformer. Al-Assad is probably guilty of killing at least as many people as Gaddafi yet it has taken eight months for Western leaders to come to this realisation. Wherever he might be right now, the Colonel must be feeling a little betrayed. The toppling of his regime – despite his recent attempts to appease the West; despite accepting Blair’s hand of friendship; despite the fact that he signed away billions of dollars worth of Libyan oil to Western corporations – will have taught him at least one lesson: to sit on a sea of oil and other natural resources is akin to sitting on a political timebomb, its fate predicated upon economic conditions and political interests in the West. And before us lies what Churchill might have called ‘the end of the beginning’. It would be too commonplace to suggest that Libya must learn from the lessons of Iraq. David Cameron, just returned from his fifth holiday this year, has been the chief advocate of this Nato mission with only Sarkozy for company. Whereas Tunisian and Egyptians can rightly be proud that their revolutions were autonomous, Libya may find itself dependent on Britain for further aid and assistance, including the possibility of the deployment of more troops to “maintain stability” and keep the old guard at bay. Yet this responsibility – for if he wishes to take credit for Gaddafi’s ouster he must also accept this aspect of it – will strip the new regime of legitimacy and strength; the constant paradox lying at the heart of liberal interventionism. If Libya were to become a proxy state, and nothing more than an outpost of Western interests, it will descend into the same chaos that we have seen, over the past decade, in Iraq and Afghanistan. This neo-imperial dogoodery may have been tactically easy but it shows the extent to which the West has entangled itself in the developing world. Intervention brought civil war to Iraq – not the democracy that was promised. Likewise, it blasted an already impoverished Afghanistan back into the Stone Age. We want freedom and security for Libyans, as we did for Tunisians and Egyptians and just as we continue to do for the people of Syria and Bahrain and Yemen. But these can only be achieved by the people alone; otherwise, their liberation will be less robust, less secure and less legitimate. Akkas Al-Ali is a playwright living in London. He writes on politics and Muslim affairs at www.the-platform.org.uk and tweets from @akkasistan. I think you’re letting your (admirable and entirely sensible) scepticism of Western intentions obscure a number of very welcome facts, not the least of which is that (for a change, perhaps) countries like the US, the UK and France are actually on the right side of events in the Middle East. 1)	We live in a globalised world. Very few wars, revolutions, significant events in world history are entirely cut off from outside influences. The US revolution was backed by France, the Soviet revolution was backed by Imperial Germany, the Vietnamese communists were backed by the USSR and China, and the anti-colonial movements striving to bring down the British Empire had the support of the USA (in many cases). 2)	Western countries had been intervening in Libya (if not militarily) for years: buying oil, selling arms, doing deals to prevent migrants reaching Europe, extending legitimacy to the Gaddafi regime through contact and shared holidays. Standing by and watching as the Libyan uprising was crushed (and be in no doubt that it would have been) would have been taking a side too. There was no ‘neutral’ option for us. Taking either side had risks, but I think we took the right one. 3)	Would any of the alternatives to Western military intervention have been preferable? A ‘Libyan only’ option did not exist. Without support, the rebels would have been massacred, the regime would have dug in further and decades from now, likely with Saif Gaddafi at the helm, the same authoritarian, crony-capitalistic regime, with its renewed military alliances with NATO would have been stronger than ever. The rebels knew this, which is why, when they realised that their hopes of going it alone had ended, they changed their minds and asked for Western military intervention. A Western-enforced no-fly zone that did nothing more than prevent Gaddafi from flying might have been more in keeping with the letter of the law of the UN resolution but would not have prevented a Gaddafi military victory. Absolute best-case scenario would have been a result that most people rightly condemned when it was applied to Iraq: a sanctions regime that hurt and weakened the people, that was easily circumvented by the regime and which became more and more risky and expensive (and politically resisted) to maintain. 4)	Would any of the alternatives to Western military intervention have been preferable in regards to the wider impact on the Arab Spring? I can’t see ANY way to answer that question with a ‘yes’ that is remotely plausible. Every single regime would have compared and contrasted Mubarak’s relatively ‘soft’ handling of the protests with Gaddafi’s ‘zero tolerance’ and drawn the entirely correct conclusion: a willingness to commit unlimited violence is virtually certain to save an unpopular regime. Failure to commit to wholesale bloodshed carries risks with almost no prospect of reward. Would any of the protests in any other countries have drawn strength or inspiration from the bloody crushing of the Libyan rebels? I doubt it. 5)	What the impact would have been on the two ‘successful’ revolutions – in Tunisia and Egypt – had things turned out differently? Would the limited gains of Tunisians and Egyptians been boosted by Gaddafi’s crushing of the Libyan revolt? Or would reformers in both countries, isolated and facing down re-organising military regimes, still with Western backing and possibly now in alliance with the least reformist elements of powerful, conservative and authoritarian Islamic parties have stood much chance of further reforming their countries? Again; I highly doubt it. So; turning to events as they actually happened… There’s no denying NATO’s importance to the rebels’ victory, but don’t let that overshadow the very real achievements of the Libyans themselves. It is Libyans who have faced down Gaddafi’s machine guns, tanks, snipers and assassins. It is Libyans who fought street by street in Misrata, and who resisted Gaddafi’s legions in the Nafusa Mountains and the coastal towns of places like Zawiyya for weeks – without the support of NATO. And it is Libyans who have thrown of Gaddafi’s rule in most of Tripoli. Don’t let suspicion of Western motives blind you to the central role Libyans have played and will continue to play in this process. And don’t draw the wrong conclusions from Western involvement in other Middle Eastern countries, such as Iraq. As popular as the US invasion of Iraq was (initially) with the Iraqis themselves, it was a war of conquest from the start, with minimal Iraqi participation. It was planned and aimed for years in advance. Its ultimate aims had nothing in common with the long term aims of most Iraqis. The arguments made in the war’s favour never made any sort of sense, and the war never commanded widespread support. Partly as a result of this contradiction, the US also never made the resources (diplomatic, economic or even military) available that might have led to a more stable, peaceful, liberal and prosperous Iraq. 1)	A relatively liberal, relatively democratic and relatively popular government in Libya suits Western interests, but is also what a majority of Libyans either want, or will be happy to live with. 2)	The Libyans have no interest in refusing to sell oil and gas to the West, so the fact that this suits Western interests is no problem. 3)	While NATO probably won’t turn down an offer to host a big military base in Libya, it doesn’t actually NEED one. The European military powers clearly have no money to support one, or interest in stationing troops there. The US got involved militarily only reluctantly, as you point out in your article, and while attempting to ‘draw down’ troops in Iraq has no interest in controversially and expensively deploying troops to Libya now. 4)	As your article pointed out; Western responses to the Arab Spring have been all over the place, veering from military intervention in Libya to the tacit condoning of the regime’s violence in Bahrain, Yemen and Saudi Arabia. Rather than demonstrating “how brilliant our Western leaders are at dealing with the crisis, skilfully adapting their approach”, this suggests to me the complete opposite: Western military, economic and diplomatic power is in swift and dramatic decline. We have been unable to restrain our allies in the Gulf, unable to intimidate our enemies the Levant, and were bounced into supporting the Libyan rebels due to our leaders’ recognition of just how irrelevant and ridiculous they looked in the aftermath of successful protests in North Africa. The Arab Spring represents a crisis (and a minor one at that) for only a certain kind of capitalism: a post-Soviet, mafia-esque crony capitalism that draws together the Bushs, Berlusconis, Blairs, Mubaraks, Salehs and Gaddafis of the world. Sadly, this kind of capitalism is likely to survive the Arab Spring, not least because it is a global, not a regional phenomenon. But the Arab Spring is not even conceived of by its supporters as an attack on capitalism. Very few of the protesters have been demanding a socialist state. The revolutionaries have included labour movements, left-wingers and liberals who favour a more redistributive state, higher minimum wages, better working conditions, less corruption, etc… But none of these things are impossible to achieve in, or contradictory to (a certain kind of) capitalism. In conclusion: the rebels face many hard challenges which include keeping the support of the people and maintaining their relative independence from Western powers. Happily, the country’s oil and gas wealth actually give the post-Gaddafi government a much better chance of succeeding at this than the forlorn liberals of Tunisia and Egypt have. Of course the West has vested interests in what happens next in Libya, but this is natural and justifiable. African and Middle Eastern countries have vested interests too, and will no doubt pursue them, just as they did under Gaddafi. While not all Western interests will be compatible with those of Libyans, at least in the short to medium term; generally speaking what Libyans independently conceive of us a successful Libya will be something that has a lot in common with what Western countries would probably like to see. Just because the West has frequently been criminally and destructively wrong in the past does not mean that it is absolutely incapable of doing the right thing from time to time. Nor does the compatibility of Western interests in Libya with Libyan interests delegitimize the Libyan revolution. Since the 1950s Western imperialists have been in the business of regime change, assassinations and propping up client states to pillage the wealth of nations. In 1953, England and America overthrew the democratically elected government of Mohammad Mosaddegh of Iran. The coup was orchestrated by the intelligence apparatus of both countries after Mr. Mosaddegh nationalized the oil industry that was controlled by foreign interests. They set up Mohammad Reza Shah Pahlavi (the shah of Iran) as a puppet authoritarian ruler who relied heavily on U.S. support. In 1961, in the Congo, the CIA in collaboration with Belgium plotted the overthrow and subsequent murder of Patrice Lumumba—the country’s first post colonial prime minister—and installed Joseph Mobutu who served America for 32 years until his own demise at the hands of Clinton administration backed proxies, Rwanda and Uganda. The war caused the death of 6 million Congolese. In 1966, Ghanaian independence leader Dr. Kwame Nkrumah was deposed by the CIA using ambitious enemies from within Ghana while Dr. Nkrumah was abroad in China on a peace mission attempting to mediate the Vietnam conflict. Another gross example of U.S. meddling in the affairs of others was the September 11, 1973 ousting and assassination of the legitimate, elected government of President Salvador Allende of Chile. The coup d’état was organized by the Richard Nixon administration and Chilean military, ushering in the brutal dictator General Augusto Pinochet. These are only three examples out of many that can be named as examples of America’s pursuit of wicked foreign policy objectives. A dictator becomes a “dictator” abhorred by his countrymen when he has overused his authority & power. These are good lessons for such leaders overstepping their power because they have come to equate power as their right. Such have been the countries that the West have been quick to ear mark & target for overthrowing these countries has been an easy effort to enter & dislodge these leaders. It is these very citizens who end up helping the overthrow take place, thus the non-requirement for stretched military equipment or personnel & the use of their own to minimize the casualties to their own countrymen. Collateral damage is what the West would call this. The countries where these leaders become “dictators” are often rich in natural resources which are one reason why they end up misusing the mandate given to them & becoming power hungry & their stooges & families end up devastating the country to which they are supposed to function as custodians. It is the lack of answering this all important question that demands the West not to use these false clichés of “freedom from dictators” as an excuse. No sooner these “dictators” are overthrown the first thing the West ends up doing is to tap the natural resources, take over the economic hubs & privatize all channels that will supply their countries a steady flow of monetary returns & economic gain. All those who played an indirect role in aiding the West by providing support end up just turning their heads away. Therefore, when we all know Iraq was a mistake it is good to now ask whether Libya is going to be another – where the consequences to the future of the people of these countries were never part of the strategy or overall plan! It is not hard to deduce that all of the efforts to overthrow Governments whatever type of governance has taken place in these countries are done so purely on the basis of acquiring the wealth of these nations. The calls for removal of these “despots” or “dictators” are mere slogans helped greatly by the mass media that provides the visuals of sensationalism to justify the overthrowing by painting the perfect picture of saviors against despots. It took no time for Mubarak of Egypt, the one time darling of the West to be portrayed with so much hatred by the media with no reminder to the public that he was an agent of the West. This is what is likely to happen to all other political leaders who think they will remain the darlings of the West & continue corrupt leadership. In any democracy where people come to power on the strength of a vote it is natural that almost half the nation will not vote in favor of the overall winner. This is certainly not basis for any country to say that a leader is opposed & plans set to overthrow him. The countries that are currently earmarked for regime change will know from diplomatic statements where their countries are heading for & this alone should suffice to ensure the country is set in order & issues that are likely to be used as excuses are properly taken care of. Corruption being one excuse is a perfect area to ensure that politicians, their stooges & the corrupt public service immediately function as they should & not as they want to run for the repercussions are far more dangerous in the present context. If any country should be saved by the West it should be Palestinians suffering in Gaza for years as a result of Israeli. What does the US do instead – it vetoes Resolutions brought against Israel in the UN. Whenever a message starts with hackneyed phrases like ‘Western imperialists’, it makes me yawn a bit. I already know what the writer will say. Can we have some originality, please? At the end of WWII, an agreement was reached at the Bretton Woods Conference which pegged the value of gold at US$35 per ounce and that became the international standard against which currency was measured. But in 1971, US President Richard Nixon took the US$ off the gold standard after he and others realized that the USA no longer had enough gold to buy back every dollar that foreign governments were handing in. In 1973, US President Richard Nixon and his new Secretary of State, German born Henry Kissinger asked King Faisal of Saudi Arabia to accept only the US$ in payment for oil, and to buy US Treasury bonds, notes and bills with their excess profits, so that USA can continue spending money and not pay it back. In return, the USA pledged to protect Saudi Arabian oil fields from seizure by USSR and other nations including Iraq and Iran. The 1973 Arab-Israeli War upset this agreement, and the Great Oil Embargo of 1974 was the result. By 1975 the Great Oil Embargo was over and all members of Organisation of Petroleum Exporting Countries (OPEC) accepted to sell their oil only in US$. The US$ now became the reserve currency of the world. Every country needed US$ to buy oil. Ever since the US$ has been the most important global monetary instrument, and only the US can print them. However, there were problems with this arrangement not least of all that the US$ was effectively worthless than before it reneged on the gold-standard. But more importantly because it was the world’s reserve currency, everybody was saving their surpluses in US$. The OPEC oil sales supported the US$ and also allowed the USA access to exchange risk free oil. Since it is the USA that prints the US$, they control the flow of oil. Period. When oil is denominated in US$ through US state action and the US$ is the only fiat currency for trading in oil, an argument can be made that the USA essentially owns the world’s oil for free. Now over $1.3 trillion of newly printed US$ by US Federal Reserve is flooding into international commodity markets each year. So long as almost three quarter of world trade is done in US$, the US$ is the currency which central banks accumulate as reserves. But central banks, whether China or Japan or Brazil or Russia, do not simply stack US$ in their vaults. Currencies have one advantage over gold. A central bank can use it to buy the state bonds of the issuer, the USA. Most countries around the world are forced to control trade deficits or face currency collapse. Not the USA. This is because of the US$ reserve currency role. And the underpinning of the reserve role is the petrodollar. Every nation needs to get US$ to import oil, some more than others. This means their trade targets US$ countries. Because oil is an essential commodity for every nation, the Petrodollar system, which exists to the present, demands the buildup of huge trade surpluses in order to accumulate US$ surpluses. This is the case for every country but one — the USA which controls the US$ and prints it at will or fiat. Because today the majority of all international trade is done in US$, countries must go abroad to get the means of payment they cannot themselves issue. The entire global trade structure today works around this dynamic, from Russia to China, from Brazil to South Korea and Japan. Everyone aims to maximize US$ surpluses from their export trade. The Petrodollar system nearly broke down during the US President James Earl “Jimmy” Carter’s presidential tenure , mainly due to double digit inflation of the US$. US President Ronald Reagan removed all controls on oil and fuel prices and all restrictions on oil drilling to restore the stability of the US$. Oil flooded the market, prices fell, and petrodollars became more valuable. These were some of the most prosperous years that the US had. But the danger remained, because the US continued to spend more US$ than it earned. The reality is that the value of the US$ is determined by the fact that oil is sold in US$. If the denomination changes to another currency, such as the euro, many countries would sell US$and cause the banks to shift their reserves, as they would no longer need US$ to buy oil. This would thus weaken the US$ relative to the euro. The USA propagates war to protect its oil supplies, but even more importantly, to safeguard the strength of the US$. The fundamental underlying motive of the US in the Iraq war, even more than the control of the oil itself, is an attempt to preserve the US$ as the leading oil trading currency. The fear of the consequences of a weaker US$, particularly higher oil prices is seen as underlying and explaining many aspects of the US foreign policy, including the Iraq and Libyan War. Until November 2000, no OPEC country dared violate the US$ price rule. So long as the US$ was the strongest currency, there was little reason to as well. But November 2000 was when France and other EU members finally convinced Iraq’s Saddam Hussein to defy the USA by selling Iraq’s oil-for-food not in US$, ‘the enemy currency’ as Saddam Hussein named it, but only in euros. Few months before the US moved into Iraq to take down Saddam Hussein, Iraq had made the move to accept Euros instead of US$ for oil, and this became a threat to the global dominance of the US$ as the reserve currency, and its dominion as the petrodollar. The euros were on deposit in a special UN account of the leading French bank, BNP Paribas. This Iraq move to defy the US$ in favor of the euro, in itself, was insignificant. Yet, if it were to spread, especially at a point the US$ was already weakening, it could create a panic selloff of US$ by foreign central banks and OPEC oil producers. In the months before the latest Iraq war, hints in this direction were heard from Russia, Iran, Indonesia and even Venezuela. An Iranian OPEC official, Javad Yarjani, delivered a detailed analysis of how OPEC at some future point might sell its oil to the EU for euros not US$. He spoke in April, 2002 in Oviedo Spain at the invitation of the EU. All indications are that the Iraq war was seized on as the easiest way to deliver a deadly pre-emptive warning to OPEC and others, not to flirt with abandoning the Petro-dollar system in favor of one based on the euro. The Iraq move was a declaration of war against the US$. As soon as it was clear that the UK and the US had taken Iraq, a great sigh of relief was heard in the UK Banks. First Iraq and then Libya decided to challenge the petrodollar system and stop selling all their oil for US$, shortly before each country was attacked. The cost of war is not nearly as big as it is made out to be. The cost of not going to war would be horrendous for the US unless there were another way of protecting the US$’s world trade dominance. The US pays for the wars by printing US$ it is going to war to protect. Muammar Qaddafi made a similarly bold move: he initiated a movement to refuse the US$ and the euro, and called on Arab and African nations to use a new currency instead, the gold dinar. Muammar Qaddafi suggested establishing a united African continent, with its 200 million people using this single currency. The initiative was viewed negatively by the USA and the European Union (EU), with French president Nicolas Sarkozy calling Libya a threat to the financial security of mankind; but Muammar Qaddafi continued his push for the creation of a united Africa. Muammar Gaddafi’s recent proposal to introduce a gold dinar for Africa revives the notion of an Islamic gold dinar floated in 2003 by Malaysian Prime Minister Mahathir Mohamad, as well as by some Islamist movements. The notion, which contravenes IMF rules and is designed to bypass them, has had trouble getting started. But today Iran, China, Russia, and India are stocking more and more gold rather than US$. If Muammar Qaddafi were to succeed in creating an African Union backed by Libya’s currency and gold reserves, France, still the predominant economic power in most of its former Central African colonies, would be the chief loser. 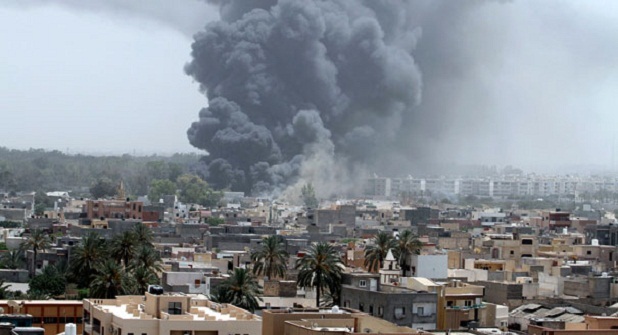 The plans to spark the Benghazi rebellion were initiated by French intelligence services in November 2010. In February 2011, Dominique Strauss-Kahn, managing director of the International Monetary Fund (IMF), has called for a new world currency that would challenge the dominance of the US$ and protect against future financial instability. In May 2011 a 32 year old maid, Nafissatou Diallo, working at the Sofitel New York Hotel, alleges that Strauss-Kahn had sexually assaulted her after she entered his suite. Accepting Chinese yuans for oil, Iran and Venzuelathey have constantly been threatened by the US. If euros, yens, yuans or rubles were generally accepted for oil, the US$ would quickly become irrelevant and worthless paper.This petro dollar arrangement is enforced by the U.S. military. On Aug 18 2011, Venezuelan President Hugo Chavez announces a plan to pull Gold reserves from US and European Banks .Venezuela reportedly has the largest oil reserves in the world. Venezuelan President Hugo Chavez has been a strong proponent for tighter Latin America integration – which is a move away from the power of the US banking cartels. Venezuelan President Hugo Chavez formed oil export agreements with Cuba, directly bypassing the Petrodollar System. Cuba was among those countries that were later added to the “Axis of Evil” by the USA. Venezuelan President Hugo Chavez has accused the US of using HAARP type weapons to create earthquakes. On Aug 24, 2001 a 7 magnitude earthquake rocks Northern Peru bordering Venezuela which doesn’t use the Petrodollar system and Brazil which has been engaged in discussions to end US$ denominated oil transactions. Is it a coincidence that these uncommonly powerful earthquakes are occurring in historically uncommonly large numbers during such a short period of time?. And that they are occurring in or close to countries that have been seriously discussing plans to leave the Petrodollar system, or are already outside it? HAARP (High Frequency Active Auroral Research Program) is an ionospheric research program that is jointly funded by the US Air Force, the US Navy, the University of Alaska and the Defense Advanced Research Projects Agency. The HAARP program operates a major Arctic facility, known as the HAARP Research Station, located on an US Air Force owned site near Gakona, Alaska. HAARP has the ability to manipulate weather and produce earthquakes, since it is capable of directing almost 4 Mega Watts of energy in the 3 to 10 MHz region of the HF band up into the ionosphere. This energy can be bounced off of the ionosphere and directed back down at the earth to create earthquakes. HAARP could potentially be used by adversaries to produce such events. Depending on the frequency, focusing, wave shape, one can induce a variety of effects such as earthquakes, induced at a distant aiming point, severe disturbances in the middle and upper atmosphere over the target area and anomalous weather effects known as the “Tesla effect”. HAARP based technology is being actively used to emit powerful radio waves that permeate the earth and subsequently cause strong enough oscillations along fault lines of targeted areas to produce earthquakes. The high power radio waves of HAARP can be used to produce such intense vibrations as to cause an earthquake. HAARP based technology can be used to encourage and produce various weather phenomena such as hurricanes, flooding, or drought through manipulation of the ionosphere. Already Russia, China and Venezuela have suggested that a HAARP type technology weapon is capable of such and attack and been used against several countries causing severe destructions in Haiti, Japan, Russia, China, Iran, Chile, New Zealand, Afghanistan, India etc. What would the probable response be to such a HAARP attack be? An armed conflict with USA? Or the elimination of the Petrodollar system and a subsequent dumping of surplus US$ into the international and US financial markets resulting in the quick collapse of the US$. Attacking these countries with HAARP would destabilize their economies and currencies and to prevent a move away from the US$ and the Petrodollar system.